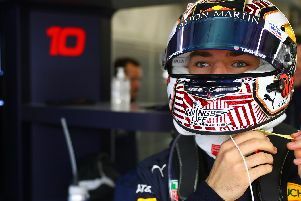 With all eyes on the teenage sensation Max Verstappen in recent weeks, Red Bull Racing’s Daniel Ricciardo is flying under the radar. Despite leading most of the Spanish Grand Prix, the Australian’s part in the race was a mere footnote, behind Verstappen’s victory and the first lap crash between Nico Rosberg and Lewis Hamilton. Ricciardo sits fifth in the championship standings with four fourth places under his belt from the opening five rounds, but even that has been somewhat over looked, with former team mate Daniil Kvyat taking the team’s only other podium of the season, aside from Verstappen’s debut win. Given Red Bull’s turmoil last season, struggling with a poor Renault power unit, being on the brink of a podium finish would have been something to celebrate. But Ricciardo admits he’s a little disappointed with his season so far. “The season has been better than expected so far, but my results on paper haven’t lived up to that,” he said. “The first two fourth places have been good, but the two after that should have ben better. And he’s right. Only tyre blowouts in both China and Spain prevented him from spraying champagne among the top three. While it’s a frustration for Ricciardo, the step forward the Tilbrook-based team have made over the winter gives him confidence. He said: “In terms of competitiveness, we’re better than we thought. F1 heads to Monaco - the jewel in the crown - this weekend, with Ricciardo going to Monte Carlo with a history of good showings . After finishing third in 2014, he nearly made it a double last year, but couldn’t pass Lewis Hamilton, and had to concede to Kvyat late in the race to cross the line fifth. While Monaco provides a unique challenge like no other on the calendar, Ricciardo - a resident of the principality - feels it is the most demanding. He said: “Monaco is the best circuit to drive on. The race itself can be a bit more processional, but in terms of a pure driving experience, no circuit on the calendar other gives me that adrenaline, that feeling of wanting more. Free practice gets underway on Thursday at 9am (UK time).